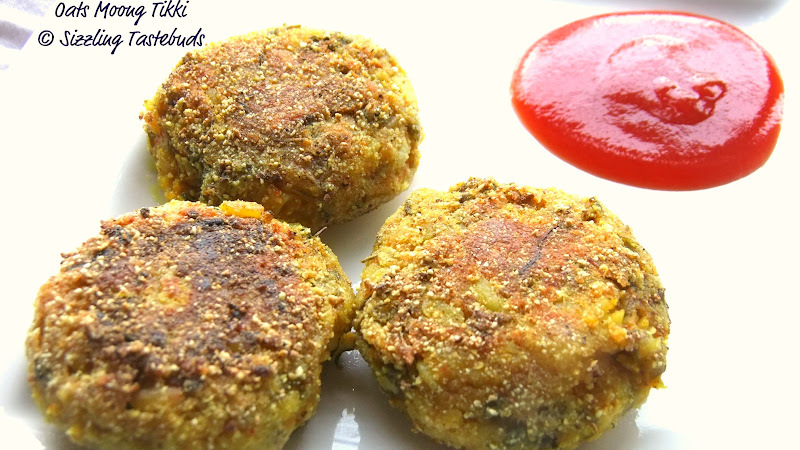 Two healthy ingredients coming together in a medley that's not only yummy but also heart friendly and tasty - Oats Moong Tikki. Wholegrains Oats is used with my favourite lentil Moong dal - to create a quick snack that fights hunger pangs. 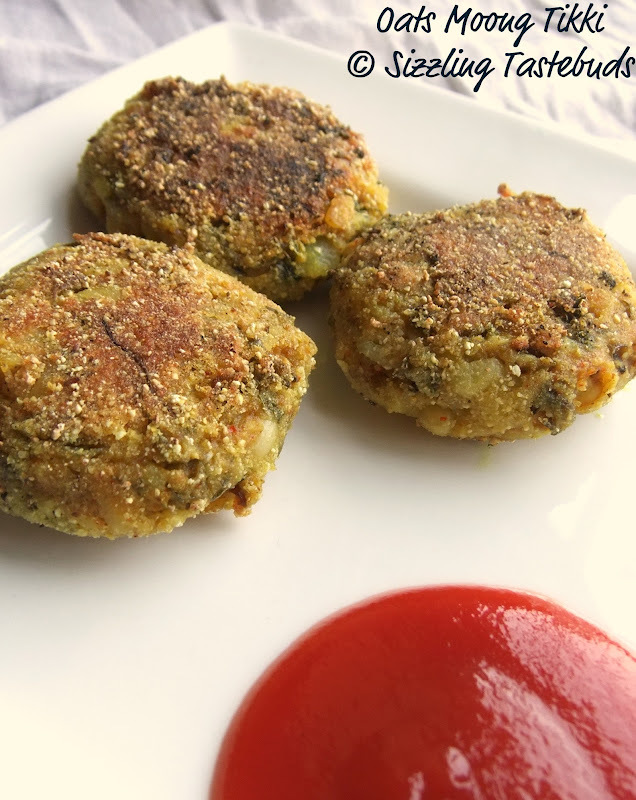 Like the Moong dal Seekh Kebab, this one too requires the dal to be boiled al dente , not mushy. Addition of potatoes is optional and would give it more volume, although it may not be suited for diabetics. One may use boiled and grated sweet potato instead. Now, to the recipe. I used sprouted Moong (ground coarsely). You may use soaked and pulsed yellow Moong dal too. Other veggies that I added in this were Cabbage / grated carrots and some onions. Makes for a quick wholegrain snack. Sending this to my own event - CWS – Oats & Raji’s Only Snacks, event by Pari. Lets get to the recipe now. 1) Roast Oats in a dry pan. Cool and powder coarsely. 2) Boil Moong Sprouts in hot water with a pinch of salt and turmeric for 10 mins till al dente. Drain and grind in a spice grinder to a coarse paste. 4) Heat a shallow pan. Roll the tikkis in the cornmeal and place them on the pan. Drizzle oil around the tikkis and cook on medium flame. Nice and healthy snack...perfect for health conscious people. GReat combo of flavors & textures.......Bookmarked. Such a healthy and hearty snack Kalyani...absolutely love it. Thanks a bunch for linking this to my event. Kalyani such a healthy snack. I definitely will make these. I was pleased to find this information , I want you to thank for your time of this wonderful read!!! I definately enjoy every little bit of it and I have you bookmarked to check out new stuff of your blog a must read blog!!! !